Dr Joana Fonseca graduated in Civil Engineering from the IST -Technical University of Lisbon, Portugal. Following four years of working in industry, she went to Imperial College London to resume her academic studies, obtaining an MSc in Soil Mechanics. 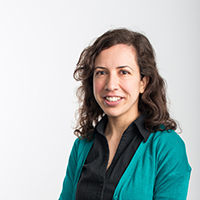 After working at AECOM for one year, Joana returned to Imperial College to undertake her doctoral research on the micromechanics of granular media, in particular the quantification of fabric evolution of a natural sand under shearing. She subsequently became a Research Associate at Imperial College's Department of Materials investigating the micro structural response of a semi-solid carbon steel; before moving to the Laboratoire 3SR in Grenoble, France, where she researched the grain-scale mechanisms that lead to failure in sandstones. In April 2013, Joana was appointed Lecturer in Geotechnical Engineering at City University. Multiscale mechanics; Image-based geotechnics; Experimental geomechanics; Micro mechanisms of granular media response; Centrifuge Modelling; Localised deformation in soils, rocks and semi-solid alloys; Grain damage and breakage; Advanced techniques for characterisation of geomaterials (x-ray tomography, microscopy, image analysis and processing). Using backscattered electron images of polished thin sections prepared from frozen samples, this study contributes a better understanding of the mechanisms of grain reorientation following cone penetration and drainage patterns controlling the cone resistance. Collaboration with NTNU Trondheim. This pioneering study presented a statistical distribution of fabric directional data for specimens of sand at different stages of shearing deformation. It made use of x-ray tomography and image processing techniques to quantify the internal structure using (i) directional parameters as particle, contact normal, branch vector and void orientations, (ii) scalar parameters and Coordination Number and Contact Index and (iii) the operational grading of the soil and the 3D shape of the constituent grains. This study provides new insight in the failure of cohesive geomaterials by exploring micro-structure in a “fourth dimension” - time or, in other words, deformation. Laboratory techniques were successfully developed to allow in-situ scans of the full specimen to be carried out. This investigation has revealed striking patterns of microscale deformation in sandstones with different degrees of cementation. This study exploited the synergies between metal casting and soil mechanics. The micro-structural response of a semi-solid carbon steel to loading was quantified by analysis of time-resolved synchrotron radiographs. The evidence provided of the austenite grains rearranging as quasi-rigid bodies, transmitting shear and compressive forces across grain-grain contacts and causing shear-induced dilation, supports the hypothesis that the behaviour of a semi-solid steel can be interpreted using a granular mechanics approach. Nadimi, S. and Fonseca, J. (2017). A micro finite-element model for soil behaviour. Géotechnique pp. 1–13. doi:10.1680/jgeot.16.P.147 . Li, Y.Q., Hu, Z.L., Fang, X. and Fonseca, J. (2015). Analysis of micro characteristics and influence factors of foundation pit failure. (pp. 565–570). ISBN 978-1-138-02707-7. Fonseca, J., Reyes-Aldasoro, C.C., O'Sullivan, C. and Coop, M.R. (2015). Experimental investigation into the primary fabric of stress transmitting particles. (pp. 1019–1024). ISBN 978-1-138-02707-7. Paniagua, P., Gylland, A.S., Nordal, S. and Fonseca, J. (2015). Microstructural study of the deformation zones around a penetrating cone tip in silty soil. (pp. 1593–1598). ISBN 978-1-138-02707-7. Fonseca, J., Nadimi, S. and Kong, D. (2019). Image-based modelling of shelly carbonate sand for foundation design of offshore structures. Fonseca, J. and Camara, A. (2017). Using advanced statistical tools to better understand students’ expectation of teaching. HEA Annual Conference 4-6 July, Manchester. Nadimi, S. and Fonseca, J. (2017). On the torsional loading of elastoplastic spheres in contact. International Conference on Micromechanics of Granular Media 3-7 July, Montepellier, France. Nadimi, S., Kong, D. and Fonseca, J. (2017). From imaging to prediction of carbonate sand behaviour. 3rd International Conference on Tomography of Materials and Structures 26-30 June, Lund, Sweeden. Nadimi, S. and Fonseca, J. (2017). On the tensile strength of soil grains in Hertzian response. Nadimi, S., Shire, T. and Fonseca, J. (2017). Comparison between a μFE model and DEM for an assembly of spheres under triaxial compression. Nadimi, S., Di Pasquale, L. and Fonseca, J. (2017). Influence of fine fraction on breakage of binary granular materials. Nadimi, S., Divall, S., Fonseca, J., Goodey, R.J. and Taylor, R.N. (2016). An addendum for particle image velocimetry in centrifuge modelling. Eurofuge 2016: 3rd European Conference on Physical Modelling in Geotechnics 1-3 June, IFSTTAR, Nantes, France. modelling. 3rd European Conference on Physical Modelling in Geotechnics 1-3 June, IFSTTAR, Nantes, France. Fonseca, J., Reyes-Aldasoro, C.C. and Wils, L. (2015). Three-dimensional quantification of the morphology and intragranular void ratio of a shelly carbonate sand. 6th International Symposium on Deformation Characteristics of Geomaterials 15-18 November, Buenos Aires. Nadimi, S., Fonseca, J. and Taylor, N. (2015). A microstructure-based finite element analysis of the response of sand. 6th International Symposium on Deformation of Geomaterials 15-18 November, Buenos Aires. Fonseca, J., Besuelle, P. and Viggiani, G. (2013). An experimental study of micro-scale deformation in a soft sandstone. Proceedings of the 1st International Conference on Tomography of Materials and Structures (ICTMS2013) 1 July, Ghent, Belgium. Fonseca, J., Besuelle, P. and Viggiani, G. (2013). Microstructure evolution on sandstones with different degrees of cementation. Proceedings of the Workshop on Experimental Micromechanics for Geomaterials (ISSMGE TC101-TC105) 23 May, Hong-Kong. O'Sullivan, C., Cavarretta, I., Fonseca, J. and Altuhafi, F. (2013). Quantitative Evaluation of Particle Morphology. Proceedings of the Workshop on Experimental Micromechanics for Geomaterials (ISSMGE TC101-TC105) 23 May, Hong-Kong. Fonseca, J., O'Sullivan, C. and Coop, M. (2009). Image segmentation techniques for granular materials. Proceedings of the 6th International Conference on Micromechanics of Granular Media 13 July, Golden,Colorado, USA. Fonseca, J. and O'Sullivan, C. (2008). A re-evaluation of the Fourier descriptor approach to quantifying sand particle geometry. Proceedings of the 4th International Symposium on Deformation Characteristics of Geomaterials 22 September, Atlanta, Georgia, USA. Nadimi, S., Fonseca, J., Besuelle, P. and Viggiani, G. A microstructural finite element analysis of cement damage on Fontainebleau Sandstone. 2nd International Conference on Tomography of Materials and Structures 2015 Quebec. Fonseca, J., Karatza, Z., Bésuelle, P. and Viggiani, G. An experimental investigation on the deformation of Fontainebleau sandstone. 16th International Conference on Experimental Mechanics, Cambridge, UK. Nadimi, S. and Fonseca, J. (2018). A micro finite-element model for soil behaviour: Numerical validation. Geotechnique, 68(4), pp. 364–369. doi:10.1680/jgeot.16.P.163 . Kong, D. and Fonseca, J. (2018). Quantification of the morphology of shelly carbonate sands using 3D images. Geotechnique, 68(3), pp. 249–261. doi:10.1680/jgeot.16.P.278] . Paniagua, P., Fonseca, J., Gylland, A. and Nordal, S. (2018). Investigation of the change in soil fabric during cone penetration in silt using 2D measurements. Acta Geotechnica, 13(1), pp. 135–148. doi:10.1007/s11440-017-0559-8 . Nadimi, S. and Fonseca, J. (2018). Image based simulation of one-dimensional compression tests on carbonate sand. Meccanica. doi:10.1007/s11012-018-0923-2 . Nadimi, S. and Fonseca, J. (2017). Single-grain virtualization for contact behavior analysis on sand. Journal of Geotechnical and Geoenvironmental Engineering, 143(9). doi:10.1061/(ASCE)GT.1943-5606.0001740 . Nadimi, S. and Fonseca, J. (2017). A micro finite-element model for soil behaviour. Géotechnique, 68(4), pp. 290–302. doi:10.1680/jgeot.16.P.147 . Nadimi, S. and Fonseca, J. (2016). Enhancing soil sample preparation by thermal cycling. Geotechnique, 66(11), pp. 953–958. doi:10.1680/jgeot.15.T.033 . Fonseca, J., Nadimi, S., Reyes-Aldasoro, C.C., O׳Sullivan, C. and Coop, M.R. (2016). Image-based investigation into the primary fabric of stress-transmitting particles in sand. Soils and Foundations, 56(5), pp. 818–834. doi:10.1016/j.sandf.2016.08.007 . Paniagua, P., Fonseca, J., Gylland, A.S. and Nordal, S. (2015). Microstructural study of deformation zones during cone penetration in silt at variable penetration rates. Canadian Geotechnical Journal, 52(12), pp. 2088–2098. doi:10.1139/cgj-2014-0498 . Fonseca, J., Sim, W., Shire, T. and O'Sullivan, C. (2015). Microstructural analysis of sands with varying degrees of internal stability. Géotechnique, 64(5), pp. 405–411. doi:10.1680/geot.13.T.014 . Li, Y., Hu, Z., Weng, T., Fonseca, J. and Zhang, X. (2014). Experimental study on the vertical deformation of sand caused by cyclic withdrawal and recharging of groundwater. Engineering Geology, 183, pp. 247–253. doi:10.1016/j.enggeo.2014.08.020 . Gourlay, C.M., O'Sullivan, C., Fonseca, J., Yuan, L., Kareh, K.M., Nagira, T. … Yasuda, H. (2014). Synchrotron radiography studies of shear-induced dilation in semisolid Al alloys and steels. JOM, 66(8), pp. 1415–1424. doi:10.1007/s11837-014-1029-5 . Fonseca, J., O’Sullivan, C., Nagira, T., Yasuda, H. and Gourlay, C.M. (2013). In situ study of granular micromechanics in semi-solid carbon steels. Acta Materialia, 61(11), pp. 4169–4179. doi:10.1016/j.actamat.2013.03.043 . Fonseca, J., O'Sullivan, C., Coop, M.R. and Lee, P.D. (2013). Quantifying the evolution of soil fabric during shearing using directional parameters. Geotechnique, 63(6), pp. 487–499. doi:10.1680/geot.12.P.003 . Fonseca, J., O'Sullivan, C., Coop, M.R. and Lee, P.D. (2013). Quantifying the evolution of soil fabric during shearing using scalar parameters. Géotechnique, 63(10), pp. 818–829. doi:10.1680/geot.11.P.150 . Fonseca, J., Bésuelle, P. and Viggiani, G. (2013). Micromechanisms of inelastic deformation in sandstones: An insight using x-ray micro-tomography. Geotechnique Letters, 3(April-June), pp. 78–83. doi:10.1680/geolett.13.034 . Fonseca, J., O'Sullivan, C., Coop, M.R. and Lee, P.D. (2012). Non-invasive characterization of particle morphology of natural sands. Soils and Foundations, 52(4), pp. 712–722. doi:10.1016/j.sandf.2012.07.011 . Canadian Geotechnical Journal, Editorial Board Member. 7th International Symposium on Deformation Characteristics of Geomaterials (the IS-Glasgow2019). (Conference) (2019). 15th GM3 Geo-mechanics: From Micro to Macro travelling workshop. (Workshop) City, University of London, UK (2017). The International Symposium on Geomechanics from Micro to Macro (IS-Cambridge 2014). Cambridge, UK (2014). IS-Atlanta 2018 Geo-Mechanics from Micro to Macro in Research and Practice - ISSMGE TC 105 Symposium.